Martie and Me! This guy knows hospitality! I have a great story that I will be writing up for tomorrow! I went to an Omaha Storm Chasers game last night and had one of the best experiences that I have had on this trip. I was interviewed by Andy Kendiegh, who I met at the College World Series. 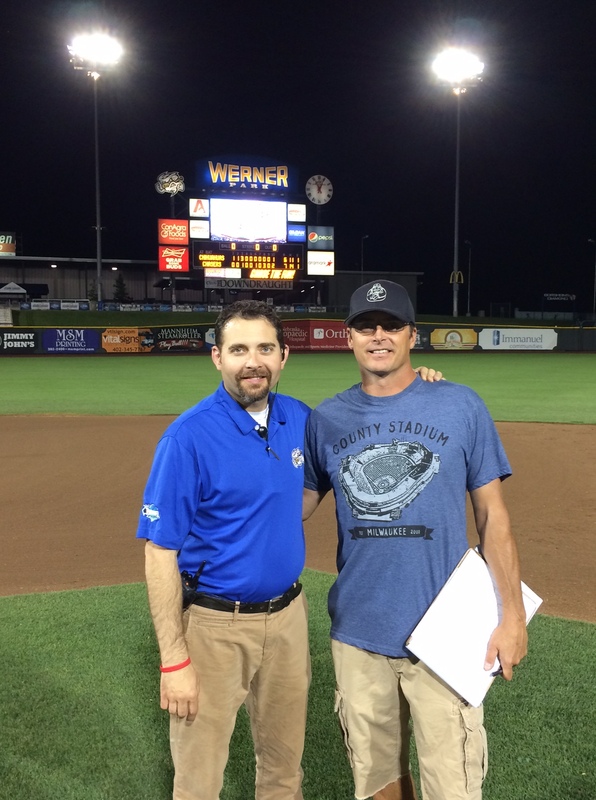 He introduced me to Martie Cordaro the President and General Manager of the Triple A National Champion Storm Chasers. I can’t wait to write the story since this guy defines the word hospitality! I drove over to Des Moines, Iowa today and went to a Iowa Cubs game. The experience wasn’t even close to what I had last night! I am still a few days behind in writing stories but I will eventually catch up. I have come out of my writing funk and have been thinking about how I want to write this story up all day! I am going to drive over to Clinton, Iowa tonight and get a good nights’ rest and then have all day to write. Please take a look at my two part story I did on the College World Series, it was a great experience. It was, also, fun to write that up. I find it funny that the stories that I like are not very popular. The stories that I don’t think aren’t very good have been the most popular. I will keep knocking them out. If people continue to read them, I will continue to write them even if no one reads them. Thanks for all the support! Even when you don’t think you’re writing perfect John, don’t worry about it, but you are getting the story out to us like your daily diary and that’s something worth reading with the experience you are going through whatever it is. Take care and keep writing well!